ZEBRA / TIGER STRIPE SOCKS ... These awesome Zebra Stripe Tiger Safari Over the Calf Socks will make a bold statement and are great fun to Wear Anywhere, & are Now Available in 14 Bright Colors. Red Lion Brand Zebra Safari Tiger Stripe Knee-High Tube Socks feature wild Animal Stripes all around the sock, and Sewn-in Heel construction with a cushioned sole and foot which provide lots of comfort and durability. 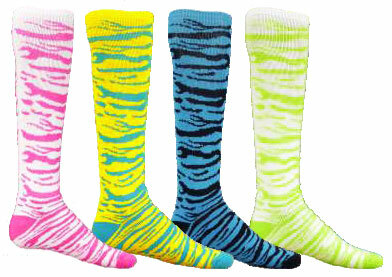 Zebra Stripe Sock Material: 76% Acrylic, 14% Nylon, 6% Polyester and 4% Spandex. - Large - Sock Size 10-13 (Ladies Shoe Sizes of 10 - 12; or Men's Shoe Size of 9 - 12.5) * * Not available in all Colors. Care Instructions: Due to the sewing weave method of these Wild Safari Stripe socks - Hand Washing or Wash Separately on Delicate Cycle, and Tumble Dry Low is highly recommended. 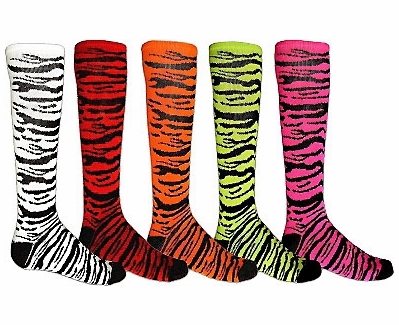 14 Tiger / Zebra Stripe Tube Sock Colors: (as shown - Left to Right) � White / Black, � Red / Black, � Orange / Black, � Lime Green / Black, � Hot Pink / Black, � Pale Pink / Black, � Gold / Black, � White / Royal Blue, � White / Red, � White / Purple, � White / Hot Pink, � White / Pale Pink (not shown), � Florescent Gold / Turquoise Blue (no longer avail. ), � Turquoise Blue / Black, � White / Lime Green. NOTE: We've done our best to show the true color of these Zebra / Tiger Stripe Socks, however since all monitor resolutions and brightness settings are different, these bright colors may look different on your computer screen. PLEASE call us if you have any questions about color-matching to uniforms, etc. Thank You. These socks were perfect for my daughter. They came in purple and white which matched her team colors, but added fun for soccer practices when she still has to wear a uniform jersey and shorts. She's 11 and they fit over her shin guards. They are very soft and have washed fine so far. The shipping was also very fast and the price was great too. I will definitely order from here again. The website was easy to search. The socks were just what the girls on my team wanted. Good pricing with a quantity discount, and quick shipping / quick delivery. I recommended the site to other coaches that were have difficulty finding the socks they needed for their team. If I have a team next year, I will use this site again. The team loves the socks!!! They are a bright pink. Had an easy exchange from the blue socks to the pink (the shirts that was ordered by the complex turned out to be a different color than what we were told). This socks are thick and hold up well. My daughter loves them. I believe she will even be wearing them outside of softball! ConsThe elastic band at the top could be bigger to help hold them up better. Would have been worth the full list price on these. they arrived quickly and were excellent in real life color, plus were very thick and good quality. I was expecting thin and un-uniform seams, not at all. to the products fitment and quality, all was FANTASTIC.! I'll definitely be using this company for all my upcoming seasons. Ordered 25 and received in 4 days. Neatly packaged and a great product. Look amazing! ConsWould like to see more discount on large orders like mine. Per sock a lil pricey. Good product however. ConsVery thick which could be a pro or con! The socks got to us in one week, just in time for our first softball game. The quality of the socks are very good and the color was perfect. The only thing the softball girls don't like about them is they are very thick so they are hot. But I would definitely order from this company again! Quick and easy ordering and delivery. Exactly what I wanted. The girls loved the design of these socks and couldn't wait to put them on for their first game. They are soft and comfy. We needed these quickly & the shipping was great. The product looked just like it did on the website & the socks were very comfortable. The Volleyball girls LOVE them! Great socks. The sizing is a little off. I ordered the small sock for 9 year olds as the sizing indicated. Thankfully they have a good amount of stretch to them. We received our socks in time for opening day! Easy to order and quick to ship, would use them again! Got the zebra socks on time. Great product and I couldn't be a happier costumer. I coach 7-8 year old girls softball. They love these socks. They are the best pair I have ever purchased. Ordered these socks for my daughter's volleyball team - they LOVE them. ProsGreat price and very fast shipping!! Glad I purchased these socks for my whole team. ProsJust the right thickness. Reasonably priced. Shipping was very fast and the socks are great. Socks are just as described, fast shipping, zero complaints. Our 5th grade basketball team got the red zebra striped socks to wear with their uniforms! They look awesome and are super thick and comfortable! I bought these socks for party favors for my daughters 7th birthday. These are good quality socks and they fit true to size. The color is bright and the pattern is as shown in the picture. I was very happy with this purchase. ProsFits true to size, As it looks in the picture, Good quality socks. They stretched over the shin guards of 13 players, all of whom had different sized feet! Looks great on the soccer field! the socks arrived on schedule!! Everyone at the park loves my daughter's socks! These are Awesome socks and perfect for our travel softball team.....the only downfall is that they are made a little thick!! The team likes them and they got here on time. Thank you. We have bought these socks before and they are wonderful and Q-sport has the best price...they wash up great and fit my kids small feet wonderfully!!! These socks are by far awesome. They are not real thick or bulky like other socks I've bought in the past. They are for the girls and fit just right so not too long or too short, and the color hasn't faded at all. ProsColor doesn't fade, and the price. Awesome Vibrant colors just like in the photo. I love the quality of the socks, they are very comfortable! Super thick and long - worked GREAT for our Volleyball team! We found these socks to be of great quality! Great customer service, got what we needed the first time around... will do business with again! Conswish the lime green was a little more green...looks a lot like neon yellowish green instead of lime green like it said.